On 29 January 2015, David Gauntlett and Amy Twigger Holroyd are doing a talk and a workshop about ‘Platforms for Creativity’, at the University of Dundee. Both are free, but please register for the workshop. See: further information. I like doing gigs. By which I mean, putting on events which people choose to come to, and where we have some talking or making or something, and where they hopefully have an interesting time. Doing live events is inevitably more strange and risky and exciting than, say, sitting at a computer writing articles. And ah, the smell of beer and sawdust. Or more likely, in my case, the smell of coffee, and some freshly-opened Lego. And I like being ‘on tour’. By which I mean, doing more than one event in different places. It’s nice to get out and about. I was memorably happy in 2011 when I did the Making is Connecting tour. It wasn’t really a tour, I just popped off on a few trips to places and talked about my new book, but I liked it. I don’t really go haring off very far as my family would miss me, or rather, I would miss them. But I even made a Google map to show where I’d been. And I like collaborating. By which I mean, being able to work with interesting people, carefully chosen! It also helps to share, a bit, the inevitable burden of anxiety about things like gigs and tours. And I like Dundee. By which I mean, I like the sound of Dundee, though I’ve never been there. Dundee always seems to have all kinds of interesting design and DIY sort of events going on, and I can’t be the first person to have spotted this as it was recently named the UK’s first UNESCO City of Design. And it’s where you can find the brilliant Mike Press. 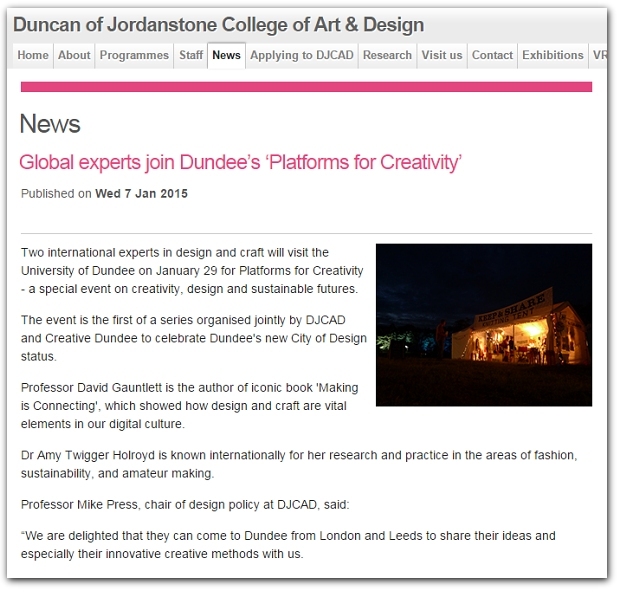 All of these things come together in the happy news that me and Amy Twigger Holroyd are doing an exciting event in Dundee, organised by the University of Dundee’s Duncan of Jordanstone College of Art & Design (DJCAD) and Creative Dundee. How can we boost creativity in society, and support people to be more creative in everyday life? Can we build cultures of making and remaking which contribute to a more sustainable world? David Gauntlett and Amy Twigger Holroyd will discuss examples from their own practices, and initiatives by others, which offer ideas about how we can create supportive platforms for creativity. Amy and David have developed some tools and processes, which can be used at an event or workshop, to get people thinking and making creatively. In this workshop we won’t use any of those. Instead you will be invited to invent some entirely new ones. We will help. It will be fun. Each participant is asked to bring along one object – or set of objects! – which you think might be fruitful ‘tools for thinking’. This could be anything really. Don’t worry about it, but bring something. 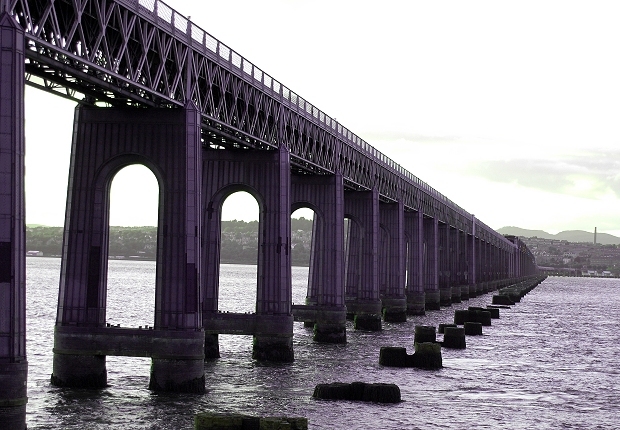 Photo of the Tay Rail Bridge to Dundee by Flickr user Ross2085 (see original), used under a Creative Commons BY 2.0 licence. View a complete list of posts. ‘Your Creative Self’ course – hello insights! Site by David Gauntlett, 2013-16. All material appears under a Creative Commons BY-NC-SA 2.0 licence.